When I walked out of the press screening for The Force Awakens last year, one of my critic friends eagerly asked me, “Well? What did you think?” I was quiet for a few seconds, then I responded, “I don’t know!” And I didn’t. The Force Awakens is such an eager Star Wars movie. I love it, but it has problems – with plot, tone, and the fact that, stripped away of its modern vernacular, The Force Awakens is essentially a remake of the first movie. Not that it mattered in the slightest – The Force Awakens made all the money last year, and returned the Star Wars franchise seemingly for good. When I left the theater for Rogue One, there were no such reservations. Rogue One is utterly fantastic and transporting – the best Star Wars movie since The Empire Strikes Back in 1980, and no other film this year has given me the joy, the heartbreak, the excitement, and that sense of wonder that Rogue One has given me this year, and this year has been an exceptionally good year for movies. Know this, now – it’s hard for me to be critical of Star Wars. I try to put that hat on and it just slips right off my head. I don’t really want to be, either. When fans sit down to this, they aren’t simply seeking nostalgic emotions for the original films. They want those feelings they had as children, but they don’t want to feel like they’re being manipulated, either. Rogue One made me feel like a kid again, and not in that nostalgic way, yearning for these movies for those years. No, Rogue One tapped straight into those feelings again, but they were new, and strong, and full. As I sat there, crying through the final twenty minutes of Rogue One, they were tears of profound happiness, because this isn’t just Star Wars – this gives us new characters, new adventures, and while it’s flavored with callbacks and the return of important pieces of Star Wars lore, it’s also its own thing. Sure, it’s full of Kurosawa, and Saturday morning serials, and all the familiar building blocks of Star Wars, but it has a clear vision, a rich emotion, and a wonderful symmetry all its own. Even Michael Giacchino’s amazing score avoids the signature leitmotifs except in key moments, and it’s just as strong without them. This is a Star Wars film that, while telling a story we are all familiar with, makes its own path. Complaints of Gareth Edwards’ reticence to actually show us anything in Godzilla go right out the window with Rogue One. There are scenes of such spectacular imagery, but more importantly they have the emotional power to match. The destruction of a lost city on an old Jedi world. The Death Star hanging upside down in orbit, eclipsing the sun. Fleets of ships meeting each other in battle. Lumbering Star Destroyers in flight. The thrill and terror of ground combat, as an Imperial Walker emerges through the fog. Edwards has made a Star Wars movie with all the recognized vocabulary, but has written something new and different. For those living on a moon in Endor, Rogue One is the story of how the Rebels acquired the Death Star plans and, to quote the original film’s opening crawl, how “Rebel spaceships, striking from a hidden base, have won their first victory against the evil Galactic Empire.” That battle is seen in full in Rogue One, but while we know the outcome, the formidable power in Rogue One is that in the thick of everything it’s easy to forget, especially when we have become so attached to these new characters. 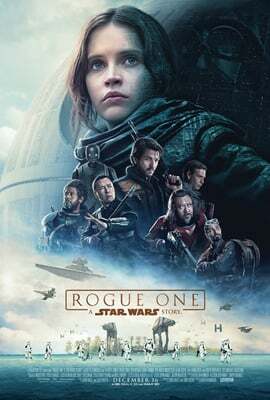 Characters like Jyn Erso (the fantastic Felicity Jones), searching for her father Galen (Mads Mikkelsen, full of graces and gravitas), who may have betrayed the Republic by helping the Empire build this devastating new weapon. Characters like Cassian Andor (Diego Luna), a Rebellion agent who has compromised his morals for the sake of a greater good. Characters like Director Orson Krennic (Ben Mendelsohn, who is terrifically sleazy and scheming), an ambitious Imperial bureaucrat who is grasping onto the little power he has before it is taken away from him. Characters like Chirrut Inwe (the wonderful Donnie Yen) and his friend Baze Malbus (Jiang Wen) – Chirrut follows his steadfast faith in the Force, and Baze is there to help his best friend find it. Characters like Bodhi (Riz Ahmed), an Imperial pilot who defects to the Rebellion for something greater than himself. Characters like Grand Moff Tarkin (Peter Cushing – yeah, you read right), who wants nothing but the utter destruction of the Rebellion, and to be in the good graces of the Emperor. There are callbacks galore in Rogue One – some subtle, some not so much – and a lot of information that may be unfamiliar with casual fans but is bread and butter for fanatics like myself. But these merely add to the flavor of Rogue One; they aren’t the meal. Yes, we get to see Darth Vader again (voiced by James Earl Jones) and he’s every bit as frightening and formidable as we remember him. But Vader and most of the other callbacks aren’t distractions, but integral to the story. This is, after all, only a few days before A New Hope. I love seeing the new Death Star, shiny, and full of dark purpose. I bet the hallways of the Death Star smell like new car. The new ships and locations are visually interesting, and I love how the scope of Rogue One, as we go from planet to planet, is established early on. I loved how the Rebellion is afraid and unsure, squabbling among themselves about the right cause of action, and that the Rebellion can get its hands dirty if it needs to. I love how the Empire is portrayed as a bunch of petty bureaucrats, scrambling for scraps at the Emperor’s table, and I love how Mendelsohn gives Krennic a surprising amount of sympathy. This is a big story – not the intimate adventures of a farmboy, but with galactic pieces in play, moving across a board of war. The script by Chris Weitz and Tony Gilroy (who also assisted with reshoots), based on the story by John Knoll and Gary Whitta, has all the cadence and rhythm that we love about Star Wars. Rogue One isn’t a somber affair either – it’s full of riveting action, and is also very funny. Surprisingly the humor centers a lot on Donnie Yen’s character, a man who is so devoted to the Force that he doesn’t seem to understand he’s not a Jedi. There’s also the Imperial strategy droid K-2SO (the wonderful Alan Tudyk), reprogrammed by the Rebellion to serve them, but full of acerbic wit and without any kind of filter to his thoughts. While the action is intense, it’s also shot very coherently and has an excellent sense of spatial geography. And when we see the real power of the Death Star unleashed, it is terrifying. When lives are lost in Rogue One, we feel them; it’s not mere spectacle. The special effects are stunning, as we would expect from a Star Wars film, but one particular effect on a certain character is nothing short of amazing – the return of Grand Moff Tarkin, with the approval of Peter Cushing’s family, is wonderful and I bet he would have loved it. While not flawless (there is still that glaze around the eyes that computer-rendered characters all seem to have), I love that Industrial Light & Magic have given us one more Cushing performance to savor. When Rogue One finished, it took me a few minutes to compose myself. I get emotional when a movie gets to me; that’s how I’m built and I wouldn’t change that for anyone. I don’t watch movies with a filter of withdrawn, clinical distance. I’m there, inside the screen, in the moment, if the movie invites me in. From frame one of Rogue One, I was back in that Star Wars Universe, and more so than The Force Awakens, it felt as if I never left. Rogue One is not just a great Star Wars movie – it’s a great movie, period, and I can’t wait to go back to it, again and again. This is my favorite film of the year.